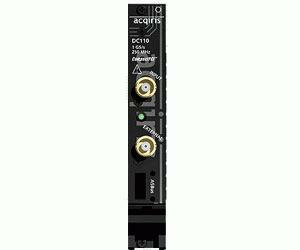 The Model DC110 Digitizer module sets new standards in PXI based data acquisition. The digitizer features fast sampling rates (up to 1 GS/s), wide bandwidth (250 MHz) and long acquisition memory (128 kpoints, optional to 2 Mpoints). The fast sampling rate and wide bandwidth are necessary for the accurate capture of high frequency signals while the deep acquisition memory allows them to be recorded over a long time period. Long Acquisition Memory - Long memories are essential for maintaining sampling rate and therefore timing resolution when capturing complex signals. For example, a Model DC110 with 2 Mpoints of memory can record a signal over a two millisecond period with a sampling rate of 1 GS/s (1 ns per point). The fast sampling rate ensures that all high frequency signal components, up to the full 250 MHz bandwidth of the digitizer, are accurately recorded. If the memory was reduced to 20 Kpoints the sampling rate would have to fall to just 10 MS/s (20,000 points per 2 ms). Frequencies above 5 MHz would then be incorrectly digitized and important events may be missed completely!